It was soggy and muddy on the Meadow when a group of stalwart volunteers turned out yesterday, 5th November. 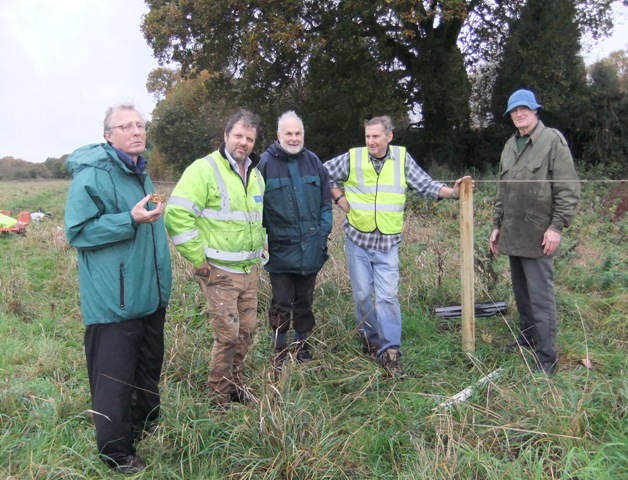 Their purpose was to start putting up fencing alongside the cemetary wall – the first step towards creating protected areas for wildlife on the Bishop’s Meadow. We have been able to implement this project thanks to grants received from the Farnham Town Council and the Tesco Community Fund. The work will be continuing over the next couple of weeks – so if you are on the Meadow please stop for a chat!